Only the wine from parcels of excellence, the oldest vinestocks and the most exceptional vattings are used to make the First Wine, and hence merit the name Château Mouton Rothschild. This accounts for half at most of the estate’s total production. 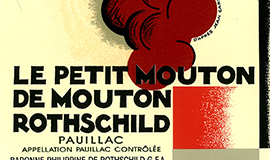 The estate’s second wine, Le Petit Mouton de Mouton Rothschild, is made in particular with grapes from younger vines: picked earlier than the others, they are vinified separately. Itself scrupulously selected, Le Petit Mouton bears witness to the rigorous selection imposed on the First Wine. The remaining wines go into the blend for the highly-reputed branded wine “Pauillac Baron Nathaniel”. 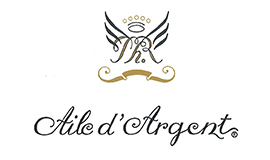 An island of white in a sea of red, Aile d’Argent is produced from 7 hectares (17 acres) of the Mouton vineyard. The sandy, gravelly soil is planted with Sauvignon Blanc or Gris (56%), Semillon (43%) and Muscadelle (1%), with a density of 9,000 vines per hectare. 50% of the wine is matured in new oak barrels. Rich, complex and elegant, Aile d’Argent, despite being produced in very limited quantity, has quickly become a standard-setter for lovers of fine Bordeaux white wines. Only the wine from parcels of excellence, the oldest vinestocks and the most exceptional vattings are used to make the First Wine.